Gong Cha vs KOI coffee, the one where I’m late to the party | Oh Look, Krill! 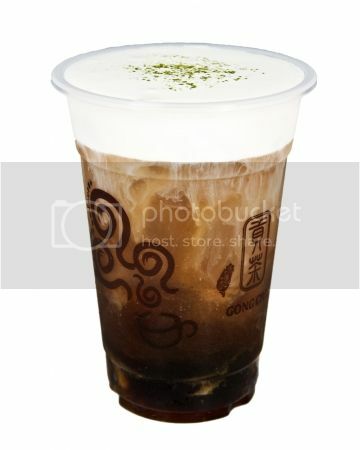 My go-to drink at Gong Cha is their Gong Cha Milk Coffee. It is basically having a thick layer of cream/milk/coconut cream(?) mixture over the iced coffee. However, unlike the picture where you have black coffee, I seem to get milk coffee instead of black. This is mostly due to the fact that the milk coffee is pre-prepared in advance and just poured out of a jug when ordered. And the creamy layer is usually topped off with chocolate powder or matcha powder, depending on the outlet. I usually have my drink with 50% sugar, as it’s just enough to cut through the bitterness of the coffee, without being too sweet; at least for me. There are three ways to drink it: 1) taking the lid off and drinking straight from the cup, so as to taste the cream first and then the coffee, 2) using a straw to have both the cream and coffee at the same time, 3) mix the cream into the drink (this is my personal favourite). The milk coffee is smooth, just a tad bitter. The cream layer is usually thick enough that it takes a long while for you to mix it into the coffee, and even then, not fully. The cream adds another layer of taste, and due to its slight saltiness, it isn’t cloyingly creamy like some desserts. The coffee drink, like the Gong Cha Milk Coffee, has a layer of cream over the iced coffee. 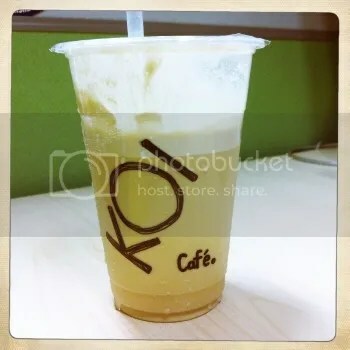 Unlike Gong Cha where the milk coffee was pre-prepared and poured from a jug, Koi uses a real coffee machine, where the beans are ground and the coffee is dispensed straight into the cup of ice. The cream is then layered on top and the cup is sealed. Like the GC milk coffee, there are three ways to drink it. A cutter may be provided for you to facilitate drinking from the cup. Or do what I did; shake the damn think until the coffee and cream are all mixed. However, Koi’s macchiato is a lot stronger than Gong Cha. At 50% sugar, it’s still a little too bitter for me and the caffeine effects are more pronounced and affects me earlier than the GC milk coffee. It doesn’t have the depth of flavour that GC has and it doesn’t have the same pull to finish like GC has. Personally, I prefer the Gong Cha milk coffee over the Koi macchiato. Mostly for the taste and the less effect I have to the caffeine in the coffee. The flavour of the slightly salty cream and the bittersweet milk coffee complement each other very well. However, I must say that the GC milk coffee may also have a high calorie content compared to the Koi macchiato, mostly from the milk coffee itself and the cream layer. So do watch your GC milk coffee intake if you don’t want to put on the pounds like I did after having it every day for two weeks.